At Rivington Rally Honda, you’re guaranteed to get the best experience a dealership can offer. When you bring your Honda vehicle in for service, our team at Rivington Rally Honda won’t miss a single detail. More importantly, we put you and your satisfaction first. At Rivington Rally Honda, we make sure that you’re completely satisfied with your experience from the moment you walk into our dealership. The service department at Rivington Rally Honda is full of dedicated service technicians that will treat your Honda vehicle as if it were their own. 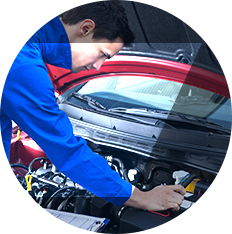 Our technicians are trained by Honda and our facilities use equipment of the highest quality. When servicing your Honda vehicle, the service department at Rivington Rally Honda will only use genuine Honda parts and accessories to maintain the value, reliability, and performance of your Honda vehicle. The technicians at our tire centre are also here to maintain the performance of your vehicle's tires. They'll rotate your tires, inspect for wear, and adjust the pressure. If equipped, they can also check the expiration date for your Tire Repair Kit bottle. Our team can inspect your vehicle's tie rod ends, suspension components, driveshaft boots, or fuel lines and connections. Whether you need to replace the engine oil or have all fluid levels checked, Rivington Rally Honda's service department is here for you. Visit the service department at Rivington Rally Honda and let us take care of your vehicle today.